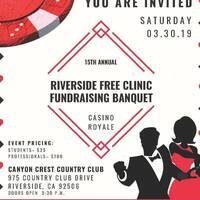 Riverside Free Clinic’s 15th Annual Fundraising Banquet will take place March 30, 2019 at the Canyon Crest Country Club, and you're invited! RFC is a student-run free clinic and provides free interdisciplinary health and wellness care to the underserved population of the Inland Empire while also providing an effective training environment for future healthcare professionals and leaders dedicated to serving the Inland Empire. For more information, please visit http://www.riversidefreeclinic.com/banquet.